Passages to the Past: new Susan Fraser King in 2010! For those of you that loved Lady MacBeth , you count me in that group, I've got some groovy news! 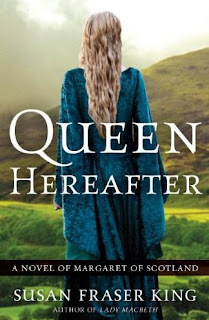 King will be releasing a new book in 2010 called Queen Hereafter: A Novel of Margaret of Scotland and it looks really good! Thanks to Daphne from Tanzanite's Shelf and Stuff for giving us the heads up on this new release. SYNOPSIS: The story of Margaret, the Hungarian-born Saxon princess who married Malcolm Canmore, King of Scots, bringing reform and foreign ways to Scotland—Queen Hereafter is also a tale of Margaret’s friendship and rivalry with Eva, a Scottish harper, and Eva’s kinswoman, the former Queen Gruadh, known as Lady Macbeth. Wow! This is going right to the top of my Wish List! I like that this is a queen that we haven't really heard about before. Second time I've heard of this book. It sounds intriguing. Another one I'll have to wait almost a year to read. I will definitely be reading. What a gorgeous cover, and what a fascinating subject. I cannot wait to read this book! My husband and I visited Margaret's chapel in Edinburgh Castle a few years ago and I remember thinking then I wanted to know more about this woman and that her life story would make a very interesting book! I'm so glad the author of 'Lady Macbeth' pursued her as a topic because I think she's a very talented author in bringing historical Scotland alive. I'm so glad that you posted this! I saw it the other day through a historical fiction fan page and was intrigued. Can't wait! Oh, it does sound good, and the cover is gorgeous. Wow, nice surprise! Thanks Amy, and thanks for all the lovely comments. :) I didn't even know the book was up on Amazon yet! I adore the cover, glad you all like it too. Margaret was a fascinating young queen, and it was great juicy historical fun delving into the rich history that surrounds her. I agree, that cover is gorgeous. Oh gosh -- based on the cover alone I want it!